Car Flexible DRL Daytime Running Light!!! For car headlight modification and customization: When the car is running , it will be white. turn flowing yellow(Amber) when the car is turning. Widely fit DC12V-24V vehicle: Universal used for auto (Car, Vehicle, Motorcycle, Scooter, Trailer etc.) light replace and modification. Flexible soft tube strip: Very soft to make any shape and can be cut to size and re-capped, you can DIY and stick it to any shape or length as you like. Waterproof buckled plug design with short circuit protection:works well in rainy or foggy days, clear bright lighting output and long lifespan. ◆ the black wire is negative: Connect to car battery negative. 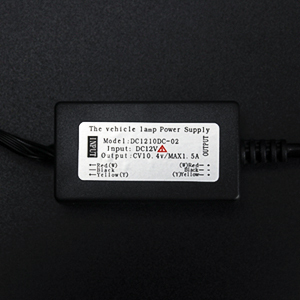 ◆ the red wire connect to car ACC or running light - the led strip showswhite light. ◆ the yellow wire connect to car turning light - the led strip shows flowing amber(yellow) light. ▲ Work as a daytime running light with ice blue light and work as a turn signal light with following yellow light.